Marabou stocks (Leptoptilos crumeniferus) are residents and local migrants throughout tropical Africa from Senegal to Somalia, South to Botswana, but rare in extreme South. While mainly scavengers, they can also be active predators, catching rats and mice with a swift snap. They can swallow whole lumps of food of up to 1kg. The only other two close relatives are found in Asia, thus the Marabou is the only one of its kind we have in Africa. Marabous prefer open or semi desert areas, there are rare within forested and true deserts. They are associated with man near fishing villages. Records show that the population of Marabous has been increasing since 1969 when the first count of the breeding population was made. In Kampala, the breeding population has increased from 11 pairs in 1969 to over 500 pairs breeding population 2007. The total breeding population in the country is well over 1,000 breeding pairs. Marabous can be seen elsewhere on rubbish dumps and abattoirs in the towns where they forage for food. They nest in close proximity to wetlands usually swamps where they forage for aquatic prey for their young. Today, Marabous can breed even more successfully near human settlements like towns and cities. This has been the case with Kampala, Masaka, Hoima, Masindi, also Kikube, Kakooge to mention but a few. This is associated with easy availability of food (artificial) and good nesting sites around human populated areas. They are most numerous in the areas of moderate rainfall near the equator, and central Uganda is favorable. Easy food availability for both adults and young. People in town around Market centres, institutions and hotels have lost sense of cleanliness, proper deposition of garbage and remains which leaves the city dirty, and in some places stinking awful. This, ironically, provides easy food availability to scavengers including Marabous. God forbid, some human beings have benefited from this carelessness. Abattoirs, butcher areas, garbage heaps, rubbish dumps, dust bins are all scattered around the city. This cannot be blamed on innocent birds looking for survival like everybody else. Security - these rather docile creatures have lived with people for long without any problem until recently when KCC decided to discredit them, just as a displacement act of their negligence. The birds are harmless and have learnt how to associate with people. This can be realised by the location of their nesting sites close to most densely populated areas around Kampala city. Others are located on less expected public places like City Square, Nile Hotel, Standard Chartered Bank and Stanbic Bank, CPS, Uganda High Court, Makerere University and others. Feeding places are anywhere remains, uncovered dust bins, uncovered KCC rubbish skips can be found. Fledging success - Nesting sites of marabous are located on such places that when the young fledge they easily find food, thus near food sources. These places must have no predation pressure for both young and adults, also should minimize natural hazards like wind breaks because of storms and winds. Kampala City Council should have appreciated the work the Marabou is doing in the City. These birds being scavengers eat virtually every piece of tissue whether rotten or fresh. The residents of Kampala seem to have learnt to live with their garbage. Food remains are scattered everywhere in now the latest way of deposing waste, that is wrapping and packaging waste in polythene bags which are then thrown anywhere along main roads, streets, floors and yards of flats. It’s only the responsible marabou that picks and cleans the potential health hazard! It’s only that Marabous are a little few with a small capacity that they cannot cope with the 1,000 metric tones of waste deposited daily in Kampala. In some pastoral nomad societies, Marabous and Vultures have been associated with the time of much death in domestic animals. This is because these animals being scavengers flourish when other animals are dying. 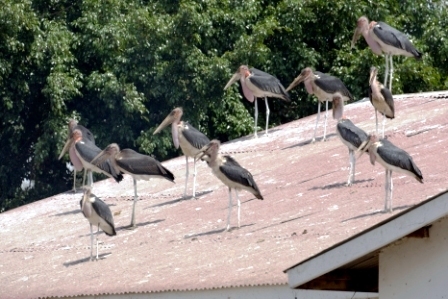 The appearance of large numbers of these birds close to human settlements is believed to forecast an approaching mass death of domestic livestock on people due to drought or war. This is definitely not the case with Kampala, but it is an indication that the garbage waste has reached a dangerous level and poses a great health hazard to Kampala city. Marabous, therefore, become indicators of the pollution level in town. It will be unfair if I do not mention the value of nature conservation. As previously mentioned, Marabous are part and partial of our environment (nature), and are attracted to places because of the favourable feeding and breeding conditions that prevail. It’s our duty to protect and preserve our natural heritage. There is only one positive, environmentally friendly and easily acceptable solution, keep the City clean and Marabous will go by themselves. Lack of transport to ferry the rubbish will not be a reason for prosecuting and exterminating the population of the innocent creatures. Failure to cover, burn, incinerate all the rubbish on KCC’s depository areas will not stop scavengers from making use of them.